With SAS you can fly directly from Stockholm to Kiruna in 90 minutes. Or with Norwegian Air you can fly directly from Stockholm to Kiruna in 90 minutes. With SJ you can go by train to Kiruna, an alternative with a possibility to experience more along the way. 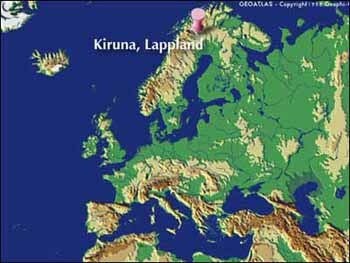 “Lanstrafiken i Norrbotten” can take you by bus to Kiruna. If you prefer to go by car there are some alternative routes. Route E4 from Luleå and Route E10 from Töre takes you to Kiruna and further on to northern Norway. The Midnight Sun Route goes from Piteå via Jokkmokk or The Inland Route (Road 45) from Östersund.